Flying Is No Longer Fun! 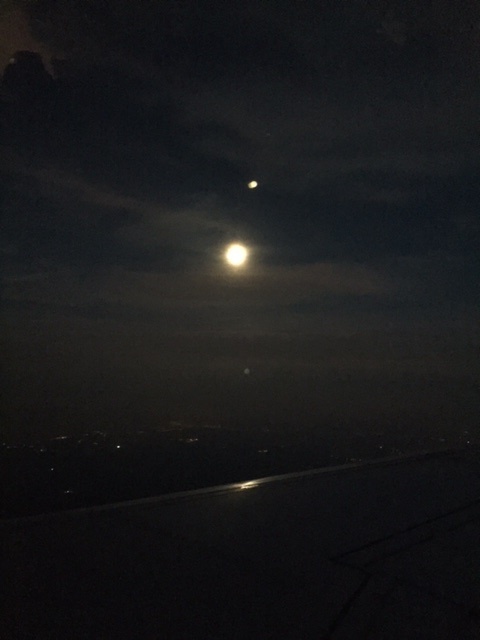 The moon from our plane window. It was supposed to be daylight when we arrived. Six and one half hours. That is how long our flight was delayed. We spent 8 1/2 hours at the airport in Kansas City in total. A very long day. I am so happy my son was with me. His amusement and laughter made the day much more enjoyable. It started as a simple 30-minute delay for an incoming plane. It quickly turned into a nightmare for those with connecting flights. When the new crew entered the plane they noticed something was wrong, the plane was extremely cold. We did not know what was happening at the time. But I did noticed that the captain had come back up the jetway and got the woman agent who was working the desk (for what she thought would be a routine flight.) She went down the jetway with the pilot. I have been flying a lot lately, and to me this indicated a major problem . She came back out and immediately anounced a one-hour delay. It was a simple problem she told us, one that they would probably just look at and note. If only that was true! But it was not to be. That one hour turned to two hours . We were told that maintenance was now looking at it and determined that they would need a part to fix a thermostat. Those with connecting flights started to line up, making their connections would be difficult. In the summer time, flights are often crowded, with every seat filled. Plans to fly overseas were especially difficult. My son was walking around the waiting area, while I read a book. He came back to where I was sitting with our carry-on luggage. “Mom, they are offloading luggage from the plane,” he said. A very bad sign. I have learned that if enough people are taken off the flight and put on another flight, the airline will cancel the ‘problem’ flight. I did not want to be waiting for hours for a cancelled flight. I absolutely hate that. I immediately got on the line. I wanted to reserve a seat in the later flight. Which I did. We were only 2 1/2 hours delayed at this point and the next flight was to leave in four hours, but you never know. I try to be flexible, but I also want to be prepared. We started watching people be sent away. I was calm. One woman was very upset because she had special concert tickets. She was making phone calls, speaking to people and speaking to the agents. I notice one of the two male agents who had replaced our original agent was leading her away from our gate. The delays piled up. The part was found, but now a team of mechanics were working on it. Instead of being an easy fix, now an entire unit had to be taken out of the plane to get the plane repaired. It was apparent that things were not going well. We were sent to another gate as a new plane was coming, being ferried in just for us. Okay, maybe things would get better. Maybe. The line to transfer or find solutions was long, since the earliest we would leave was 4:30 pm. Our scheduled flight now was leaving five and half hours late. Some people went home or to a hotel. They had no chance to make any connections, so they were rescheduled for the next day. We went to the new gate and waited. The woman with the concert tickets was back! What happened? The flight on Delta was cancelled so she came back to United to get on the original flight. Needless to say she did not make the concert. The plane came. You could feel the excitement from the crowd. Although many had left our group, others who were on a flight with a stop in Chicago had chosen to change to our flight to Newark. We lined up ready to board. The new agent asked if any of the first class flyers wanted their original lunch meals. One raised her hand. The agent had to go to the other gate to get the food. People moaned. The crew got off the plane. You could feel the anticipation as we waited for our crew to arrive. And waited. And waited. My son burst out laughing. I got up to ask to transfer to the other plane. But the agent was not done. “Also I have been told that we cannot serve the meals from first class as they have been on the plane for too long. I am sorry.” So first class passengers were getting no food. Neither was my son or I or anyone else. They had just joined us peons. And there are not many food choices at the Kansas City airport. My son and I had already gone without a real lunch. It was obvious that we were going without a real dinner. I was first in line at the counter. “Can you just transfer us to the other flight, please.” It was scheduled to leave one minute after the flight we were supposed to go on. But I just was not sure we were actually going to go anywhere. “I could” she said. “But it is scheduled to go on the original plane that you were supposed to go on, and it is still being fixed. What do you want to do?” I really had no choice, at least I knew this plane was in working order. I stayed with the original flight. We all sat and waited and talked to the people around us. When the crew arrived we all applauded. When we boarded the plane, people were laughing. When the plane took off we were amazed. I actually heard a few people applaud. The captaiin came on and apologized. But we had been at the airport for 8 1/2 hours. The airline did not offer us food coupons. There were no snacks on the plane. Luckily I had purchased some snacks for us. We arrived 6 1/2 hours late. Instead of 3 pm, we arrived at 9:30 pm. A wasted day. We missed dinner with my brother. We were tired and cranky and hungry. At the luggage carousel, my son and I waited with others from our flight. Making jokes about whether our luggage was actually put on the new plane, and what else could possibly go wrong. However our luggage did arrive. Our ride from the airport did show up within minutes of us leaving the terminal. The passengers had bonded during our time together. People who were strangers became temporary friends. But it was now over, we were all returning to life outside of the world of the airport. Earlier in the odyssey I told my son I was going to send an email to the airline when I got home. I was angry. But United emailed us first, apologizing to us and offering a link for a gift for each of us. You know it is bad when that happens. I have 90 days, so I have not checked the link yet. Although nothing can give me back my day, which was spent watching the world from a terminal window, I do appreciate the apology. But in reality flying is no longer any fun. It has been a crazy time since I found out the lineage of my two times great grandmother Esther (Etka Lew) Wolff. I have connected with distant family through the Tracing the Tribe Facebook page. I have been welcomed to see our very large family tree on Geni. And I have found out who my ancestors were back to 1720. But the amazement does not seem to end. In one of the many emails my two distant cousins sent me I saw that a branch of the family, one of my three times great uncles descendants migrated to Kansas City. What! I live in the Kansas City metro area. I have lived here for 18 years with no family except my immediate family. For a while my husband had cousins here, but they moved away. Now I find out I have distant cousins here. Really? And then I thought about it. Many years ago, when the Bialystok Home for the Aged still existed and they still did a newsletter, I would get the “Bialystoker Stimmer.” I was a supporter of the Home for the Aged because my great grandparents, my grandma and my parents were always supporters. So the tradition continued. In any case, in one issue I read, there was an article by a man and his daughter from Kansas City. And I knew his daughter. I mentioned the article to her, and we would joke about it and call ourselves “Landsmen,” which we were. So when I heard that I had distant cousins here, I immediately thought of her. I sent her an email. She wrote back. And it all fit. They were from the same small town, Ciechanowiec. Her dad’s last name was Lewin but he changed it to Levine in the USA. We were third cousins. And I thought that was all. But my contacts back east (EW and AB), who had been feeding me all this information, were not done. They had heard of my friend/cousin. But there were others as well. They sent me a diagram. And asked if I recognized any other names. I did. One was a boy the same age as my son, they had gone to school together through second grade and had played together. The family belonged to the same synagogue my family belonged to. We have been friendly acquaintances for 20 years. We are related through the father. I sent them an email because I find it all so interesting. I would never have expected to find family in Kansas! I am still in a state of determined amazement. Jew from the small Polish village of Ciechanowiec settled in Kansas and Missouri! My daughter lives in Israel now. Many of her cousins who she is in contact with are also third cousins. These are branches of my family and my husband’s family that we have been in contact with forever. She has many second cousins, as my husband’s first cousin moved to Israel 27 years ago. These cousins have all been welcoming and loving. It is strange that some lines of the family stay in contact, and we see these cousins even with the distance in relationship; we consider ourselves close family. But some lines of a family are lost over time. The movement from Europe. The aftermath of the Shoah; the younger generations moving away. I had information from my Grandma and my Aunt mentioning these lines of the family, but we had no contact with them. What an amazing coincidence to find some of these third and fourth cousins in Kansas. Of course we are distantly related. Third and fourth cousins are not so close. But it was surprising to find a connection where I was not expecting to find one. But even more important, it shows that the Jewish people are really one. We are interconnected. My family, with its approximately 20,000 descendants is a perfect example of the inter-relations between all Jewish families. And even though a number of my family, from both my maternal and paternal sides perished in the Shoah, we remain. That is the most amazing aspect of my continued search for my ancestors how we are truly one people.